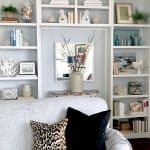 Recently, I went over to style my client, Adrienne’s newly built living room bookcases. 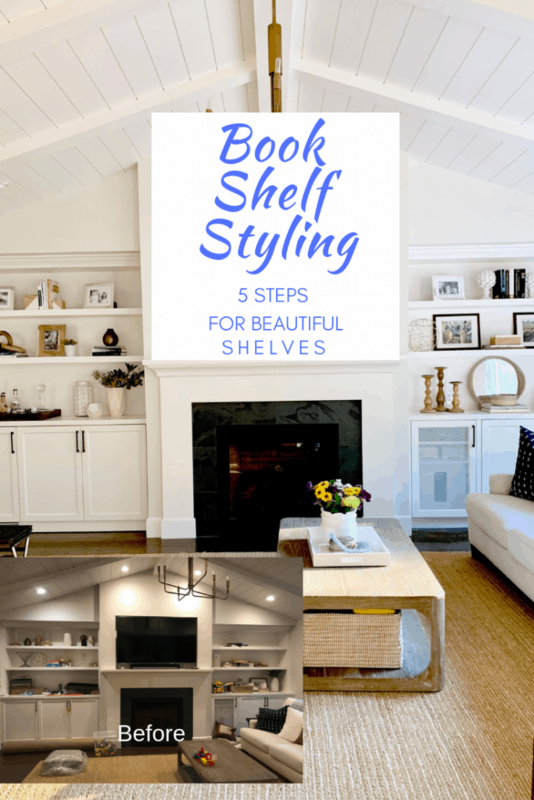 Here are my bookshelf styling tips that I use all the time! Adrienne is a busy working mom with three kids aged six and under! She piled all her accessories on the shelves just to get them out of the way (she wanted you to know that she knows this doesn’t look good 🙂 ). You might as well dust while you are at it. 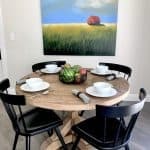 Put all your accessories on your dining room table or floor. I watched a few episodes of the Marie Kondo method on Netflix and I noticed that with organizing your clothes she recommends taking everything out of the closet first and piling it on the bed… sort of the same concept as mine about emptying your shelves completely! It’s important. STEP TWO Layer art or larger family photos at the back of shelves. Place other large accessories on shelves aiming for symmetry. For example, Adrienne’s photos of Napa were the first things on the shelves. I also always ask my clients what their favorite items are. Notice the collection of white pottery below? I like to style things in three’s, too. They have a beverage refrigerator built in here so this makes a nice little bar (until the kids get in high school…but that’s another story). STEP FOUR Fill in with books. You can use them to add prominence to some of your objects, too. Make sure your items are pulled forward and not pushed to the back. STEP FIVE Add plants or flowers, real or faux. Isn’t Adrienne so cute??! We didn’t have to buy anything new for the shelves (she’s an avid flea market, HomeGoods and places like Crate and Barrel, etc., shopper). There is still furniture coming for the other side of this room. Have you watched or read any of it? It’s all over blogland, and I was cynical at first as I feel I keep things fairly uncluttered… but NO…I’m really a hypocrite! My closets, pantry, kitchen shelves, and paper files are not making me happy. Yesterday, I organized my purses as she says to (some inside of others with handles showing so you know where they are). I had three I was hanging on to as they were sort of expensive but never use them. You ask yourself “does this give me joy?” If not, it’s easier to let it go…and it works. You might think I sound crazy so just watch three or four episodes and let me know what you think? I have a lot more work around the house to feel more joyful…but at least my purses are easy to find and access. Wish you a joyful week! 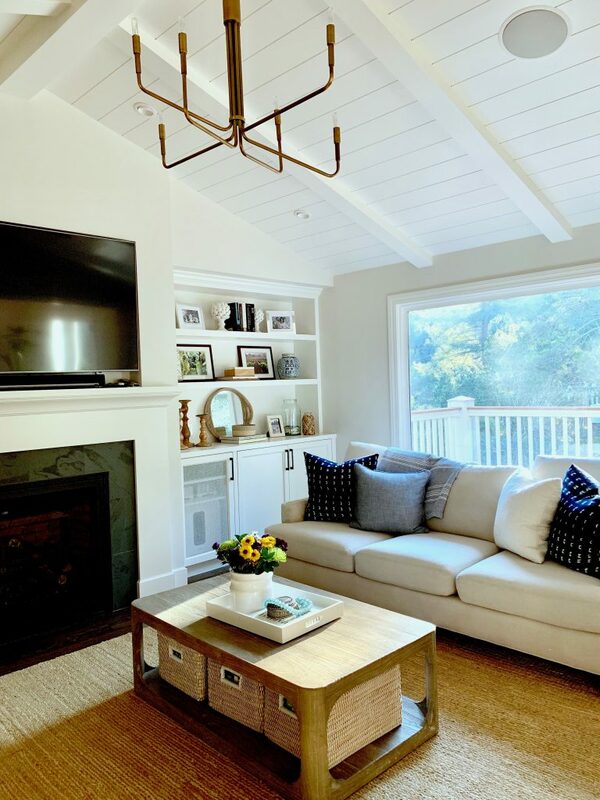 Adrienne is beautiful…and she must be thrilled she didn’t have to buy anything new (after incurring the cost of built-ins)! Easy to follow steps. Yes… you should see how gorgeous the whole family is. Im very nervous to watch t hose videos!!! 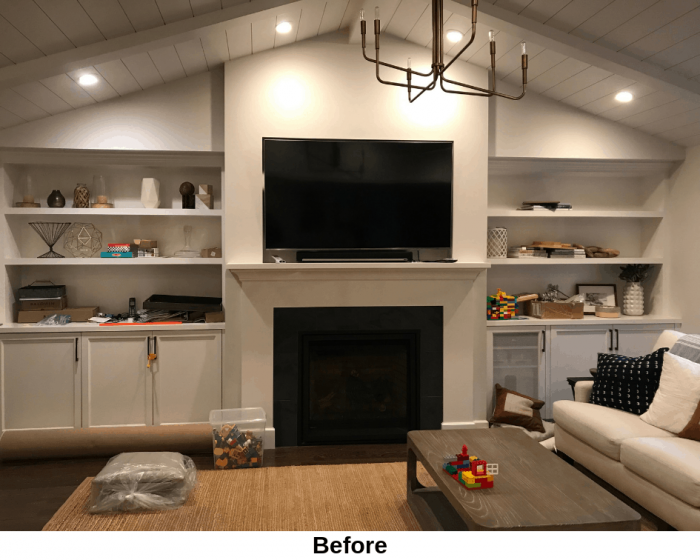 I don’t have time to redo all my storage and closets!!! lol!!!!!! OK OK OK – I”ll go watch. Well, Joni…I just started out with my purses 🙂 You can start out small. They look beautiful! I agree with emptying everything out first. I did that when I reorganized my master closet and it forced me to make better decisions about what stays or goes. She must be thrilled with the new look! I’m pretty neat and tidy, too. Even my drawers are tidy but they are FULL!!! I organized my candles the other day and threw out the ones that were less than half full. I feel so much better. Would love to see some hutch (china cabinet) styling suggestions. I have a great pine hutch that I love displaying my collection of ceramic dishes, pitchers, plates and knick-knacks on but it’s getting a bit tired. Any advice would be welcome! P.S. I’ve emptied it out multiple times and still end up with putting everything back. I just love my treasures and love looking at them! I store a lot of dishes in an antique bookcase and it’s hard to “style” since its full…and we need the storage. I’d love to see a photo of yours. You did such a nice job with the shelves! I also like what I see of the living room (love the pillows!) and hope we get a look at that, too, eventually! I have watched all episodes of Marie Kondo on Netflix. I watched the first one while sitting on the couch, and then watched the remaining episodes as I cleaned closets, cupboards and drawers. It was good inspiration and lots of practical advice. So many of the things I really agonized over letting go have already been forgotten now that they’re out of our house. It’s also made me reevaluate how much I buy. No more buying stuff simply because it’s cute or a good price!! We don’t have a tv in our kitchen otherwise I would watch while organizing in there! Bravo to you for all you have done!! We don’t have a TV in our kitchen, either, so I watch Netflix on my iPad. It comes in handy all over the house. I love your system for shelves! We have a lot of books, ironstone, transfer ware, photos, etc. to fill our shelves, so I spend a lot of time styling and restyling and refreshing. Last year we had all 4 bedrooms painted, including the closets. Emptying them was a serious job, but I was adamant about limiting what went back in them. It’s been wonderful living “lighter” but takes diligence (for me at least) to maintain. I feel like painting is a good excuse to refresh everything!! I confess, I watched Marie Kondo’s complete Netflix series. I consider myself an organized person and I regularly pare down, but she had tips that I find even more helpful than I would have thought. Plus, she’s so darn cute and enthusiastic. It was fun. Yes! Like how to fold underwear! You’ve had another successful Mary Poppins handbag moment: everything needed is already there! 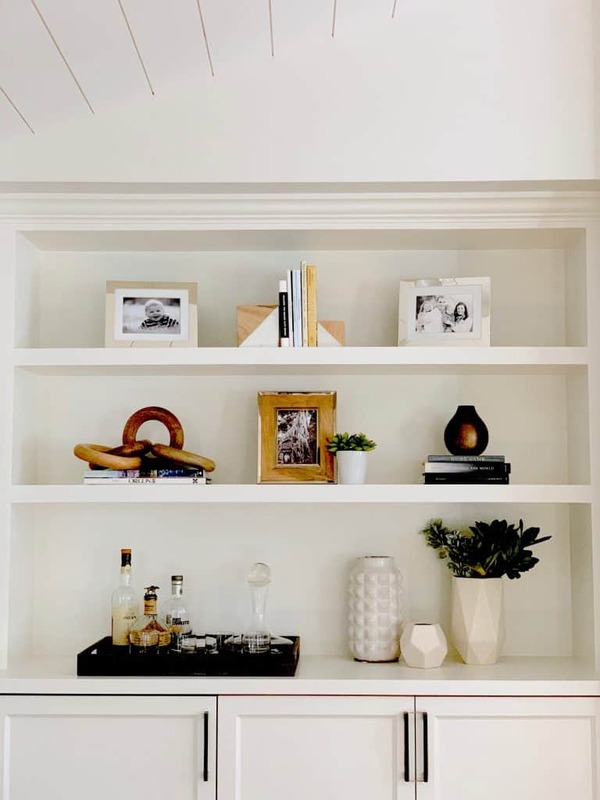 While I will always be on the other side of the great bookcase divide (believing that the best styled bookcases are the ones filled with books that have brought you joy and continue to bring you joy,) you always do leave a room looking more alive, organized and serene. 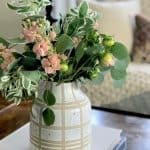 You also leave behind great tips for the owners to continue to add style to their homes empowering people to love where they live with more confidence. Your clients are lucky to have you on their side. 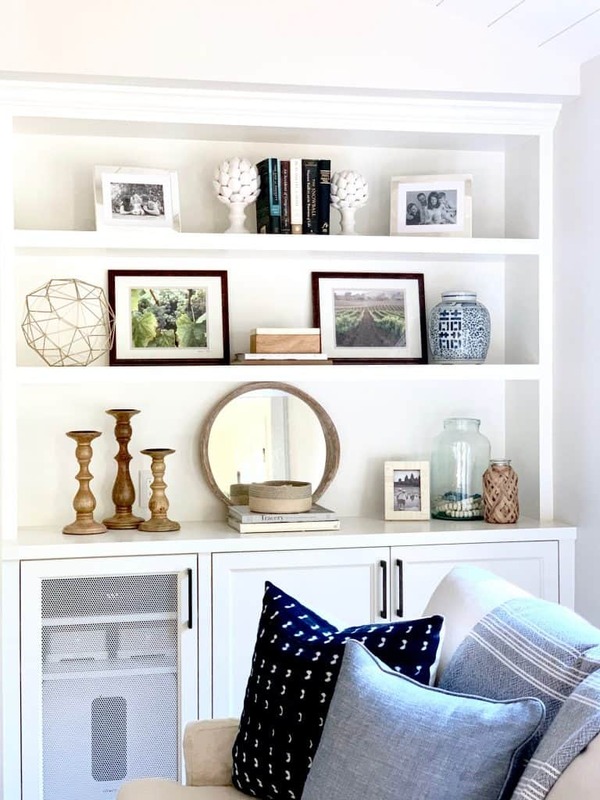 I have a guest room with book shelves containing lots of my (and my husband’s) favorite books…basically crammed with them but there is some styling too. I read Maria Kondo’s book when it first came out a few years ago, but I really loved watching her in action during her shows! Even the most organized person can learn tips from her! 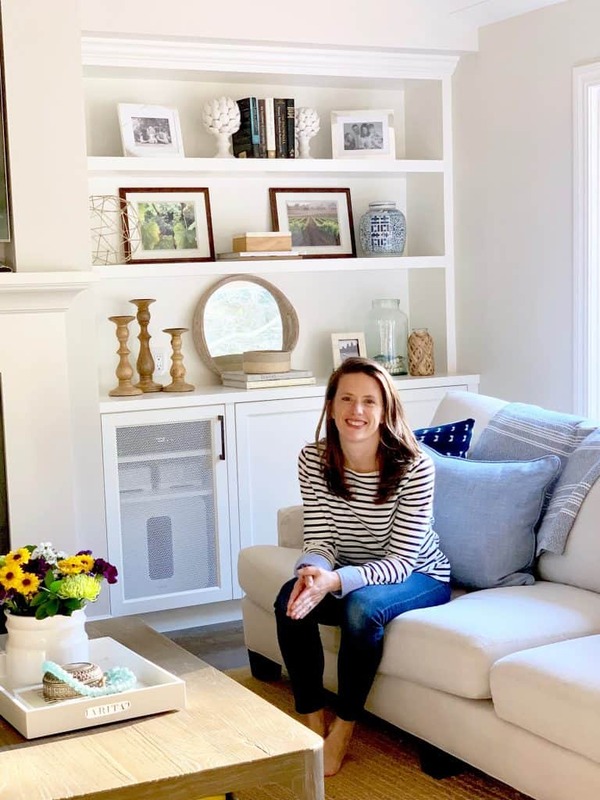 I watched her shows in the month of January which coincided with a monthly challenge I do with my sister – no clothing purchases & no home decor purchases! February’s challenge is purging! We purge the number of days in February – adding it up = 406 items! So needless to say her organizing methods are hard at work in my house with many non-profits benefiting from these challenges. Your blog is one of my very favorites – I love your design and thoughtful work you show with each client! Keep them coming! I took some screenshots so the next time my shelves (or any area) look cluttered and haphazard I will have a great guide to what I WANT them to look like❤️ Also… thanks for saving me money in advance! As usual you did an outstanding job. It is amazing what one can do by simply shopping your own home. That’s what I do with my flip cabins that I always buy furnished. They usually come filled with a bunch of junk but once I move things around, edit and throw a lot out, chalk paint stuff, etc., eventually I have a whole new look. Nice work! I need to refresh ours – appreciate the tips. I delved deep down the KonMari rabbit hole in 2015 after my dad passed away and we cleaned out his house. We had so much junk in attics and the basement, but had no problem parting with it after the experience at my dad’s place. I think it’s a great method for paring down useless stuff. Stopped shopping for accessories even. 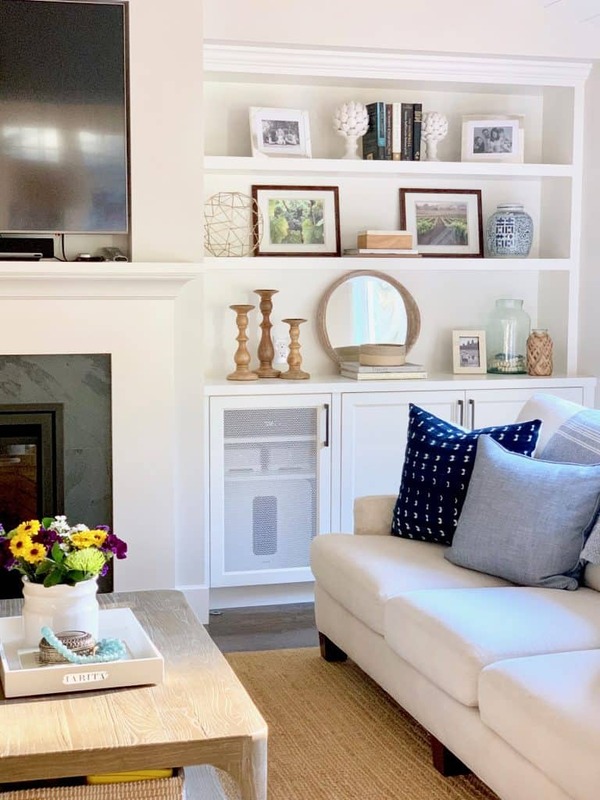 We display things that are meaningful to us, and I like the look of seeing my grandmother’s China or my grandfather’s sculpture collection or my own art better than something trendy. I really like the shape of the plant/branches in that tall vase on the left. What is it? I have so many books that my shelves are mainly that. Library. I should get rid of some, but I like to have them to lend to friends. It isn’t quite the same to say, I have a great book for you, let me check it out from the library. I have books on my book shelves. I love them. I have open areas with decorative objects and photos. Why don’t you ever style shelves with lots of books? I am sure they are not designer worthy but I do get upset when I see used only as “props”. That styling is pretty but I would love to see more books on the shelving. As always, your magical wand has made these bookshelves gorgeous. 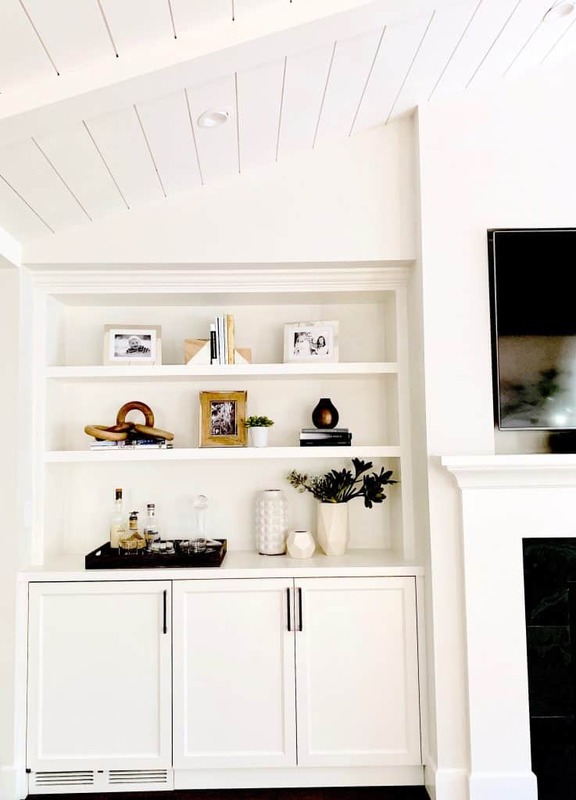 I love shelving that surround a fireplace and wish I had the room to do that in our living room. Adrienne is beautiful and I’m sure she loves the way her shelves came out. Terrific job, as usual!